Stuart Christie writes on the Spanish Civil War, 70 years after General Franco's victory. WRITING IN the preface to l’Espagne Libre, in 1946, the year of my birth, Albert Camus said of the Spanish struggle: “It is now nine years that men of my generation have had Spain within their hearts. Nine years that they have carried it with them like an evil wound. It was in Spain that men learned that one can be right and yet be beaten, that force can vanquish spirit, that there are times when courage is not its own recompense. It is this, doubtless, which explains why so many men, the world over, regard the Spanish drama as a personal tragedy”. On 1 April 2009 seventy years will have passed since General Franco declared victory in his three-year crusade against the Spanish Republic. His victory was won with the military support of Nazi Germany and Fascist Italy, the moral support of the Roman Catholic Church and the covert diplomatic connivance of Britain and France, the prime movers in the Non-Intervention Agreement. It brought not peace but the outbreak of a vengeful and prolonged forty-year war of vindictive terror, humiliation and suffering for the losers, the Spanish people. Apart from the victims of the war itself, between 1939 and 1951 at least 50,000 Spaniards paid with their lives for their support of the Republic while hundreds of thousands paid with their freedom. Today, forty-four years after Franco’s death, Spain still has unfinished business to deal with. In July 1936, progressive people everywhere seized on the Spanish workers’ successful thwarting of the attempted coup by a cabal of ultra-rightist Spanish generals in Spain and Africa. It became the great idealistic cause of the twentieth century’s first half. Some, particularly the Defence Committees of the anarcho-syndicalist labour unions of the Confederación Nacional del Trabajo (CNT) – the ones who seized the initiative by declaring a revolutionary general strike and arming the people in the face of government opposition, confusion and middle class horror – saw it as the start of the social revolution, whereas the middle classes, the petite bourgeoisie and the Spanish Communist Party (PCE), which sought to become their champion, chose to view it in terms of a struggle between bourgeois democracy and fascism. But despite their differences, for all of them it became the line in the sand; the rallying point for over 30,000 mostly idealistic and heroically selfless men and women from fifty-three countries who realised that here, possibly, was an opportunity to connect all the 1930s’ struggles for social and political justice and, at the same time, roll back the inextricably interlinked rise of fascism and reaction. During the first days of the army uprising, as many as 1,500 foreigners living in Spain took to the barricades to join the armed workers’ defence groups in surrounding the barracks and quashing the military rebellion. Among these were two hundred athletes who had come to Barcelona to compete in the People’s Olympiad (Spartakiad) organised by the trades union movement and the Popular Front government, in protest against the official Olympic Games then taking place in Hitler’s Berlin. The Peoples’ Olympics had been due to open on July 19, the day the fascist army marched out of their barracks to seize control of Barcelona. Many workers and intellectuals of every conceivable nationality had been horrified by their own governments’ inaction in the face of fascist aggression and had gone off to fight for justice on their own. The first, informal, ‘Internationals’ were the foreign volunteers who flocked to join the union-organised militia units such as the Durruti, Ascaso and Ortíz columns, named after their charismatic organisers of the Nosotros action group. People of all ages, from fourteen to seventy, and all nationalities – French Germans, Italians, Moroccans, British and Americans – enrolled in these and other anarchist and socialist expeditionary columns to liberate Zaragoza and hold the front line in Aragón. Some of these militia columns were led by four Scots’ bagpipers, four of whom had been due to open the Spartakiad ceremonies on that fateful day. Toronto Star journalist Pierre van Paassen, for example, refers to the fact that one of Durruti’s adjutants, a Briton by the name of Middleton, had jumped ship in Barcelona when he learned of the workers’ uprising and the social revolution that was sweeping the country. 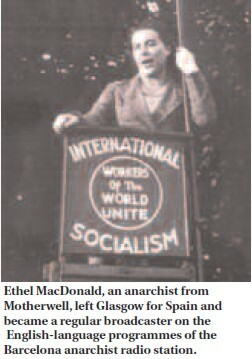 Ethel MacDonald, an anarchist from Motherwell, just a few miles up the road from where I lived in Blantyre, was another of the countless people who made this individual pilgrimage to Spain. In October 1936 Ethel left Glasgow for Spain with another Scotswoman, Jenny Patrick, a long-time anarchist activist who had been the secretary of the Glasgow anarchists during the industrial troubles of 1916. Ethel became a regular broadcaster on the English-language programmes of the Barcelona anarchist radio station. Their high profile and defence of the social revolution led to both Ethel and Jenny being arrested and held without trial by the Stalinist secret police. But they were among the lucky ones who survived and were able to return to Glasgow. Her extraordinary story is told in Chris Dolan’s An Anarchist’s Story: The Life of Ethel Macdonald, a fascinating personal account of the pivotal events of the spring and summer of 1937 as seen through the prism of a Scottish anarchist woman who was at the centre of contemporary events. Dolan’s book has particular resonance for me because of the people and places he talks about, names known to me personally from my youth: Charlie Doran, Bob Smillie and ‘Big’ Dan Mullen from Victoria Crescent in Blantyre where I spent my formative teenage years in the late 1950s and early 1960s. It was there I first came across these names and others, local men like Tommy Brannan, Tommy Flecks, Willie Fox, dead Brigaders who were spoken of, rightly, as heroes and martyrs. Nor was it unusual on a Friday or Saturday night for old anarchist and communist miners to end rancorous discussions about the role of the Communist Party in Spain brawling outside the Miners’ Welfare. But not everyone could make their own way to Spain, and for some the process was too hit and miss – too uncontrolled and unmonitored. The decision to set up an organisation to capitalise on and channel the popular wave of anti-fascist enthusiasm and idealism, and coordinate the mobilisation of volunteers to fight for the Spanish Republic was taken in Moscow on September 18, 1936, during a meeting of the Comintern Executive Committee. It was a little over a week after the Non-Intervention Committee met for the first time in London, and just five days after the decree from Spain’s pro-Soviet Finance Minister Juan Negrín authorising the transfer of all of Spain’s 510 tons of gold reserves first to Cartagena, and thence to Moscow – for safekeeping! This Comintern-led initiative – which became known as the International Brigades (IBs) – should be seen, therefore, in the context of Soviet geopolitical leverage and paid-for, stringsattached, military aid. It should also recognised that membership of the Partido Comunista Española (PCE) at the outbreak of the uprising was small and largely middle class, perhaps between thirty- and a hundred-thousand, and with little influence among the workers when compared with the two million members of the anarcho- syndicalist CNT and the million and a half members of the socialist UGT. The PCE had virtually no militia presence of its own in the late summer of 1936, yet by the end of the year its membership had increased tenfold to around a million. By championing the privileges, status and property of the professional as well as the urban and rural bourgeoisie against the rapid advances of the anarchist-led social revolution, the Catalan counterpart of the PCE, the Partit Socialista Unificat de Catalunya (PSUC) – formed on July 23rd 1936 with between 3,000 and 6,000 members – increased its membership dramatically within a matter of months. Spanish anarchist historian Jose Peirats estimates that in Catalonia, between July and October, the PCE recruited to its ranks 8,000 landowners and around 16,000 middle class ‘professionals’. The most powerful reason for the rapid growth in influence of the PCE, however, was Stalin’s decision to provide military support for the Republic which had nothing to do with altruism or working class solidarity. His decision to send arms to Republican Spain was based on the diplomatic and strategic exigencies of Soviet foreign policy. For Stalin, Spain was a pawn in a diplomatic chess game being played out by the three great European power blocs – the Axis, France and Britain, and Russia. Stalin hoped that the surrogate war being fought in Spain would provide him with sufficient breathing space to divert or minimise the effect on the Soviet Union of a wider European conflict, which was looking ever more inevitable. Hitler’s expansionist policies would, Stalin believed, drag Germany into conflict with Britain and France leaving Russia as an onlooker. However, Soviet foreign policy at the time was in fact counter-revolutionary, requiring that the European balance of forces should not be disturbed as any perceived support for social revolution in Europe would upset Russia’s delicate military alliance with France and its relationship with Great Britain. But the problem, as dissident Marxist historian Fernando Claudín pointed out, was that neither could the USSR realistically dodge its duty “to show active solidarity with the Spanish people in arms without risk of losing all prestige in the eyes of the world proletariat”. Take Dolores Ibárruri Gómez for example, La Pasionaria whose statue looms over Glasgow’s Clyde Walkway. She was a member of the Political Bureau of the Central Committee of the Spanish Communist Party, a parliamentary deputy and a Comintern delegate. She effectively blackmailed the Republican government into accepting Communist Party demands which included: the right to nominate and appoint political commissars and Soviet military cadres to each army unit; the dismantling of the agricultural, industrial and service industry collectives that were being set up in the social revolution that was then building momentum; and the outlawing of the independent Marxist and allegedly ‘Trotskyist’ POUM. Remember, too, that this period coincided with the start of Stalin’s most murderous phase of his reign of terror within his own country, flagged by the Moscow show trials that opened in August 1936. The message was simple: if the Republican government refused to accept the conditions demanded by the Communist Party then the Soviet freighters lying offshore would not unload their cargoes of arms and ammunition. Charlotte Haldane, the honorary secretary of the IBs’ Dependants’ Aid Committee in the UK, has stated that each national Communist Party was assigned a recruitment quota linked to the size, age and the strategic importance of its paid-up membership, as well as the number of fellowtravellers it could count on. The Communist Party of Great Britain, for example, because of its size, had a smaller quota than most, but even so, between late October 1936 and the summer of 1938, it was still able to recruit between 1,800 and 2,400 volunteers (estimates vary here), of whom 563 were killed and most of the others wounded. A NEW and fascinating contribution to Scotland’s role in the Spanish Civil War, Daniel Gray’s Homage To Caledonia brings together for the first time riveting accounts of the plots and sub-plots of the 1930s Scottish- Spanish connection, together with the personal stories and testimonies of some of the 549 Scottish volunteers who made Spain’s struggle their own. Most of this Scottish contingent (around twenty-three per cent of the British Battalion) came from the urban and industrial areas of Aberdeen, Dundee, Edinburgh and Glasgow, specifically Maryhill, Springburn and Bridgeton and, of course, the mining communities of Lanarkshire and Fife. Of the ninety-two Scottish IB volunteers killed in Spain, sixtyfive were from Glasgow; another nine came from the Lanarkshire mining communities around Blantyre. Sixty-seven per cent of them were members of the Communist Party. With the British Battalion so overwhelmingly dominated by Party cadres, rank-andfile militants and fellow travellers, it’s hardly surprising that so many of them belonged to either the CP or the Young Communist League. Even so, in spite of tight Party discipline, most rank-and-file volunteers were far from being ideologically sectarian; their reasons for risking their lives to fight for the Republic or for socialism may have been complex and diverse, but the one thing they all had in common was a visceral loathing of fascism and a profound sense of international solidarity. With the UK’s Foreign Recruitment Act making enlistment in a foreign army illegal, the British authorities became increasingly rigorous in their attempts to enforce nonintervention and implement the law, so Brigaders were recruited discretely through the Communist Party network by local cadres and ‘Spanish Aid Committee’ organisers who took it on themselves to vet all volunteers, especially non-party members. Politically, around sixty per cent of the Scottish IB volunteers were paid-up CPGB members with twenty per cent or so drawn from the Labour Party, with, perhaps, a scattering of ILP, Scottish Socialist Party or Scottish Workers’ Republican Party members. The remaining twenty per cent claimed to have no formal political allegiances. These figures were more or less the same for the whole of the British Battalion of the XVth International Brigade, although it’s impossible to say how many of the 110 Labour Party members were also – as Lewis Clive was – covert CP members. The British Battalion appears to have had at least seven ILP volunteers which to me was unusual given that the ILP line was close to that of the CNT defence committees: that the social revolution was inseparable from the war. It was for this reason that most of the 175 ILPers who fought in Spain did so with the anarchosyndicalist militias or, like George Orwell, with the anti-Stalinist, Marxist POUM. Few British workers had passports in those days so the usual practice was for the volunteers to make their way across the Channel on special weekend returns – which didn’t require passports – and then travel down to Spain with the help of the efficient and well-disciplined French Communist Party – and the French authorities mostly turning a blind eye. The first batch of foreign volunteers to arrive in Spain in the autumn of 1936 were obliged to surrender their passports to the ‘Foreigners’ Bureau of the Catalan Communist Party, the PSUC, then controlled by the NKVD, Stalin’s secret police. Later the International Brigade established its own ‘Control and Security Service’ headed by Alexander Orlov, chief of NKVD operations in Spain. Their passports were never returned and were used in covert NKVD and GRU clandestine operations. There was also an IB ‘Cadre Commission’ set up in Albacete in February 1937 to monitor and assess the “trustworthyness’ of volunteers” and to expose ‘fascist’ spies and Trotksyist-anarchist provocateurs. A cadre report on the British Battalion, for example, listed 363 British volunteers, half of them CPers, and described forty-one them as ‘cadres’, 142 as reliable, and 133 – of whom forty were Party members – as ‘weak or bad’. In contrast to the Comintern, the anarchist international, the AIT, did not mount a central recruitment campaign. The CNTFAI, the anarcho-syndicalist labour union and the Spanish anarchist federation, disapproved of recruiting foreigners into its militias – except, of course, for stateless refugee volunteers such as the Italians and Germans – preferring instead for comrades to show their solidarity and defend the revolutionary nature of the Spanish Civil War by actions and applying political and industrial pressure at home. The French Anarchist Federation, however, did have a network in place for sending foreign revolutionary volunteers into Spain, but on a much smaller scale than that of the Comintern. The reality was that more than two thousand foreign anarchist volunteers joined the CNT militias. Between October 1936 and September 1937, when they were finally incorporated into the Republican army as Spanish Foreign Legion units, seven International Brigades were headquartered in Albacete under the commissarship of the paranoid Comintern Secretary Andre Marty – the XIth, XIIth, XIIIth, XIVth, XVth, 129th and 150th. Each of these, led by a brigade commander and a political commissar, consisted of four battalions of mainly foreign volunteers organised by language group and ethnic background – to avoid problems of communication. An increasing number of Spaniards were conscripted into the Brigades as the war progressed, but there was no attempt to teach Brigaders Spanish until 1937, and even then few actually bothered to learn the language or even have much to do with their fellow Spanish Brigaders. There was actually a fair bit of racism, especially in the French and German IB Battalions. The fact that so few Brigaders understood Spanish meant they were largely dependant on the overwhelmingly pro- Soviet and virulently anti-Trotskyist and anti-anarchist International Brigade press for information as to what was happening in Spain, especially relating to the events of May 1937 in Barcelona and the NKVD-led Stalinist repression both in the Soviet Union and in the Spanish rearguard. On February 16, 1937, the IB paper Soldado de la Republica stated that after the latest of the Moscow trials “the whole world can now see” that the Trotskyists were “agents of German-Japanese fascism…and an incredible system of provocations, sabotage and murder” who in Spain had been revealed as “the artificial mist that hid Franco’s Fifth Column…. The unmasking of Trotskyists united all International Brigaders”. Tragically, most ordinary International Brigades volunteers were unaware of the strategic geopolitical ‘great game’ they were engaged in on behalf of Stalin. They were idealists manipulated by cynics, lions led by vipers. Morale was undermined constantly, especially among non-Communist volunteers. Jason Gurney, the British sculptor who fought with the IBs from December 1936 until August 1937 described the process in his memoir, Crusade In Spain: ‘the pattern of unkept promises of support, chaotic orders and communications, followed by inquests, the search for scapegoats and their execution as enemy agents was to underlie the whole course of events. The battle of Jarama in February 1937, the first major battle in which the British participated, was presented as a victory, mainly because they managed to recover the ground they had lost, but it was won at a heavy price with over a quarter of the five hundred-strong British Battalion killed and a comparable number seriously wounded. Around thirty-five Scots died in the main battle at Jarama and many were taken prisoner, including James Maley of the Calton who died in April 2007. Steve Fullarton, the last surviving Scottish IB veteran, passed away just a year later. The erosion of Brigade morale began with Jarama. Partly this was due to the harsh realities of a war in which they were used as expendable shock troops, but other things were bubbling below the surface at Brigade level. Command of the Battalion had been due to be taken over by Scotsman Wilf McCartney, but he was shot and wounded, allegedly accidentally, by Brigade Commissar Peter Kerrigan, the CPGB representative to the Comintern and the commissar for the English-speaking International Brigaders at Albacete just before the British left for Jarama,. McCartney was forced to return to Britain due to his injuries and command of the Battalion passed to an Englishman, Tom Wintringham. The next battle in which the British Battalion was involved occurred a few months later, in July 1937, at Brunete, the first major offensive of the war. It quickly turned into an unmitigated disaster, both tactically and in terms of personnel. Of the 331 Britons who answered roll call on July 6, 1937, the first day of the battle, by July 24, when Franco’s forces finally broke through the Republican lines, 289 of them were dead, wounded or captured. With such enormous losses — most battalions were now down to under 200 men —morale plummeted and there were increasing outbreaks of insubordination and desertion. Around 298 British volunteers deserted (16 per cent) compared with about 100 Americans. In the British Battalion, punitive action focused on indiscipline and desertion, with two re-education centres and three jails established at IB HQ in Albacete specially to deal with these cases. After the Battle of Guadalajara, in March 1937, André Marty reported to the Comintern that the Brigades were on the verge of collapse due to the loss of men through demoralisation, deaths, casualties and desertions. Men previously commended for their courage were now described as “cowards, amoral and alcoholics”. No one knows how many IBers were executed by the Servicio de Inteligencia Militar (SIM) and the Chekists, but it’s probably somewhere between fifty and sixty, mostly French, German, Hungarian and Slav volunteers. Only one Briton, a Glaswegian by the name of Peter Kemp, is known to have been formally executed, as were three from the Lincoln and George Washington battalions, but according to Jason Gurney “a large number disappeared without trace”. Morale deteriorated further in the Spring of 1937 with the Stalinist onslaught against the CNT defence committees and the various, smaller, anti-Stalinist Marxist parties in the rearguard, in their attempt finally to suffocate the social revolution and wrest control of working class Barcelona from the rank and file of the CNT unions. This scenario was presented to the world as a legitimate governmental move to crush a Trotksyist-fascist-anarchist coup d’etat – and the world believed it, or pretended to. In spite of a demoralising defeat at Brunete, in August 1937 the British Battalion regrouped and fought on to the Fuentes de Ebro prior to an advance on Zaragoza, which they failed to complete. From there they pressed on to Belchite where they emerged victorious for a time following a particularly bloody hand-tohand, close-quarter, battle with the Francoists. The Battalion’s greatest success, however, was its key role in the capture of the Aragonese town of Teruel on 8 January 1938, but this proved short lived as by the end of the month the British were forced into a series of retreats in the face of a fierce Francoist onslaught. The reality was that the forced dissolution of the libertarian Council of Aragón by the Communistforces of General Lister’s XIth Army in August 1937 effectively extinguished the last guttering flame of the social revolution in Spain. It was the beginning of the end for ‘Loyalist’ Spain. The disintegration of the 450 kilometres of Aragón’s front lines in March 1938 underlined the profound impact that the devastation of the rearguard had had on the popular will to resist. By the summer of 1938 the Soviet Union had failed in its diplomatic aim of establishing an anti-German alliance among the Western governments and, with a fascist victory looking increasingly inevitable, Stalin’s foreign minister, Litvinov, informed the British ambassador that a Franco regime would be acceptable to the Soviet Union provided Spain didn’t become a German or Italian satellite. The Soviet delegate on the Non-Intervention Committee then drew up a plan for the withdrawal of all foreign combatants in Spain and the granting of belligerent rights to both sides, allowing them to purchase arms legally. Finally, on 21 September, in a cynical attempt to win the support of Western governments – and at the height of the Ebro offensive in which 7,000 foreign volunteers were fighting – Juan Negrín, announced to the League of Nations that his government had decided, unilaterally, to withdraw all foreign combatants from the Republican zone. Following the British Battalion’s withdrawal from the Ebro for repatriation, Sam Wild, commander of the British Battalion, called for volunteers to return to the front line for 48 hours to give republican forces time to bring up fresh troops. All of the men agreed to go back; many never returned. In the three days of fighting at the Ebro following Negrin’s announcement, more than two hundred members of the British Battalion were killed, wounded, or reported missing. The evacuation of the IBs was neither easy nor quick, but even so most British survivors were home by the end of December, leaving about 6,000 volunteers still remaining in Catalonia, albeit demobilised. In fact, eighty per cent of them re-enlisted to fight in the rearguard actions holding up the Francoist advance. The IBs were among the last Republican troops to cross the border, which they did on 9 February. Two weeks later, on 24 February France recognised the Franco government followed quickly by Britain. And their legacy? Even though the IBs were relatively few in numbers, they played an important role as shock troops, and central to their effectiveness — especially in the early days of the war — was their political and moral commitment, for which they paid a heavy price, with 549 dead and thousands more wounded. But whatever the International Brigades may have done for Spain, they did considerably more for the image and credibility of the Communist Party and the Soviet Union. The moral example of the IBs certainly benefited the Republic, and as the civil war progressed the idealism and heroism of the rank and file had an even greater impact on the wider labour movement, with a marked increase in the membership and influence of the CP. In spite of their politics, the rankand- file IBs’ genuine internationalism and sense of working class solidarity and selfless heroism could not have been in starker contrast to the treachery of the Bolshevik leaders of the Soviet Union or the rank hypocrisy of the socialist and bourgeois politicians of the western democracies. But what these ‘premature anti-fascists’ did impacted on posterity and inspired later generations with their bravery and selfless courage. It certainly made an impact on me, and it is because of them that I came to see the Spanish Civil War as ‘unfinished business’, especially in the years 1962 to 1964 when Franco was unleashing a new and brutal wave of repression. With horror I read about the arrests and torture of striking miners and industrial workers, the judicial murders of the Communist Commissar Julian Grimau for alleged war crimes, and the garrotting of two young anarchists, Delgado and Granado, for a bombing of which they were totally innocent. It appeared to be starting all over again and no one was doing anything about it, given Spain’s strategic importance during the Cold War. I may not have been wise or competent in what I did, but I did not have the benefit of hindsight. My conscious choice about the manner of my involvement in the anti-Francoist resistance was as a fighter – as opposed to being a helper of Franco’s victims. To do otherwise would have felt like running away, psychologically and intellectually. It would have been hypocritical of me to choose what I knew to be the easy and safe – but useless and ineffective – options of demonstrations, picketing and leafleting and not to challenge Franco head on as it were, following the example of those extraordinary men and women who went to Spain in 1936 and 1937 to fight for a better world. I felt I had a moral obligation to intervene on behalf of past, present and future victims of Francoism. It was a just war and a just cause – the assassination of Franco. My authority was my conscience and the ghosts of Franco’s victims since 1936. And so, on July 31st, 1964, just three weeks after my eighteenth birthday, I went back to Blantyre to pack my Bergen, folding my kilt ostentatiously on top, and made the final preparations for my trip to Paris – and my rendezvous with destiny in Madrid. Like George Orwell, Ethel MacDonald, ‘Big Dan’ Mullen and thousands of others in 1936, I was off to Spain because at that time and in that atmosphere it seemed the only conceivable thing to do. The assassination did not succeed, which is another story, but Écrasez l'Infâme! The selfless men and women who fought in Spain for the idea of liberty against the reactionary priest-, gun- and prisonbacked, medieval ideology that was Francoism are the forgotten dead and a now-dying generation to whom we have an obligation of remembrance, a duty of commemoration which is honoured, at least in part, in Dolan’s and Gray’s respective books. In 1945 New York Times correspondent Herbert Lionel Matthews wrote the following: “Spain was a melting pot in which the dross came out and pure gold remained. It made men ready to die gladly and proudly. It gave meaning to life; it gave courage and faith in humanity. It taught us what internationalism means, as no League of Nations or Dumbarton Oaks will ever do. There one learned that men could be brothers, that nations and frontiers, religions and races were but outer trappings, and that nothing counted, nothing was worth fighting for but the idea of liberty”. This tells the story of two Aberdeen Trawlers in the Spanish Civil War - it's interesting though told in a rather bland way.